People's Choice Beef Jerky is a brand of People's Sausage Company, Inc. based out of Los Angeles, CA. It's a family-run business that's been around since 1929. See our previous reviews of their jerky. 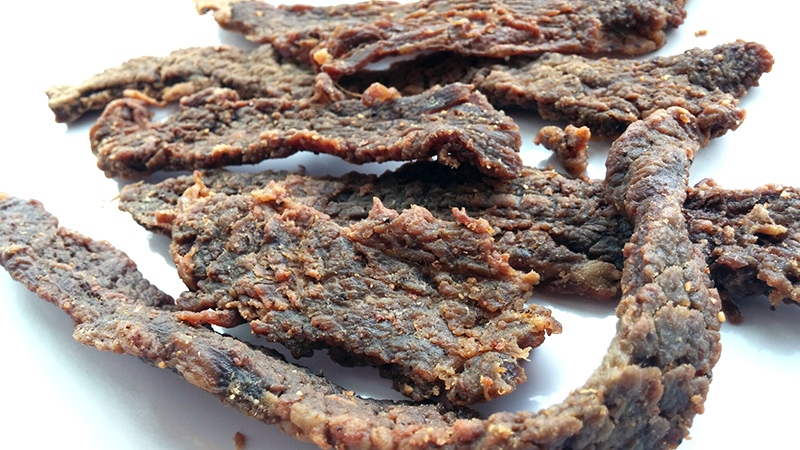 Their "Carne Seca" line of beef jerky is based on the Mexican-style dried beef popular in Latin societies. Being that People's Choice Beef Jerky is located in downtown Los Angeles, they've found a lot of success marketing their line of Carne Seca to local hispanic grocery stores and carnicerias. The flavors of "Limon" and "Limon con Chile" are made with all natural ingredients, are gluten free, and contain no preservatives. The first flavors that hit my tongue is a tangy, lemon with black pepper. I can also pick up a cooked, steak flavor with a bit of fat mixed in. Light hints of garlic come in along with a moderate level of saltiness. For being labeled, "Limon" this seems to hold up well. The citrusy note of lemon is the first flavor that comes on, though not in a strong amount, just enough to notice. It's almost as if this lemon has a bit of lemon zest mixed in too. 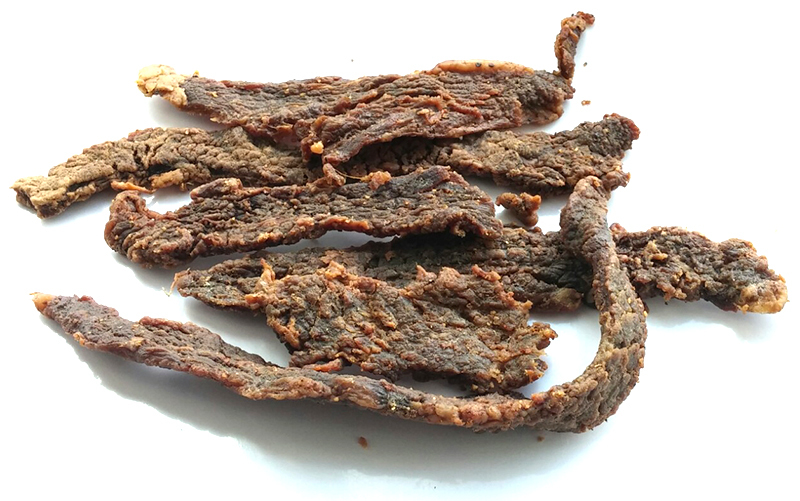 Otherwise, the flavors that define this jerky starts mainly with the natural meat flavor, slightly aged, giving off a pepper fried steak character mixed with a light amount of fat. There's a noticeable black pepper seasoning and touches of garlic, along with the light initial lemon taste. The meat consistency seems great, easy to chew, but maintaining a jerky chewiness and a clearly recognizable feel of steak. It's largely dry, but retaining a light bit of moisture. There's bits and streaks of fat on these pieces that add to the overall flavor. Once chewed down soft, it feels just like a piece of steak. 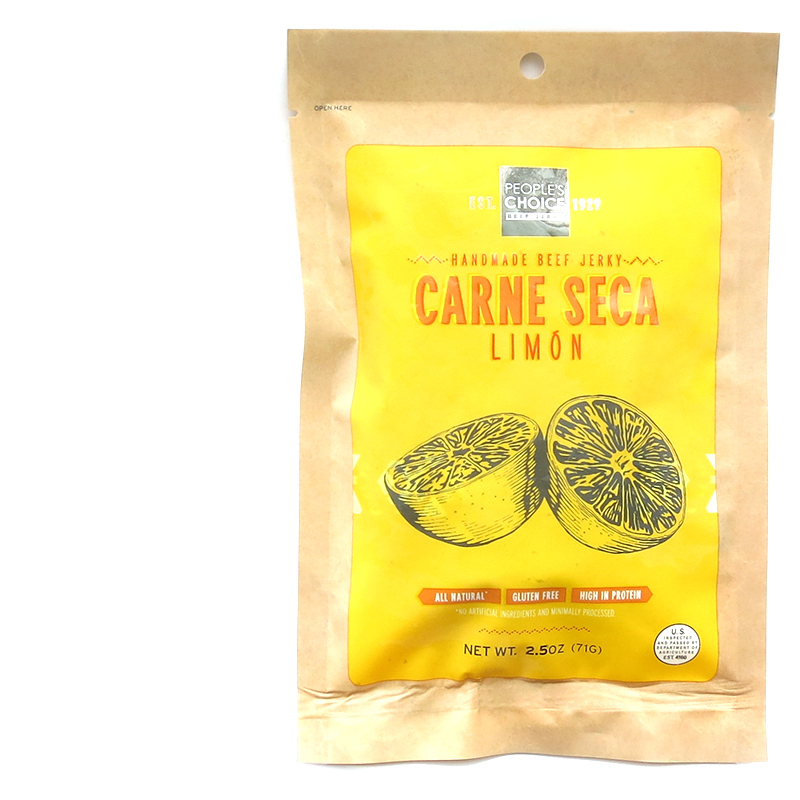 Verdict: This "Limon" variety of Carne Seca from People's Choice is actually really good. I love the peppery, lightly fatty, steak flavor that takes the spotlight. I also love the easy, but meaty, and steak-like chewing texture. Interestingly, there's no soy sauce or worcestershire in this, and yet the ingredients still generates a good deal of savory, seasoned chewing. The amount of lemon flavor is light, but enough to be noticed right away, and actually creating a bit of tanginess.